loading speed of up to 260 tonnes per hour.The system’s flexibility also allows delivery to stock in the event of dead truck times.Therefore high packing and palletizing plant capacity utilization is assured even during times of missing trucks. By combining the proven components of stationary palletizing technology with conveying technology, the SpeedFlexx system offers unique and reliable operation. Filled bags are handled with shipping and in-house pallets, as well as sheets. The loading cycle begins with the scanning of the truck-bed surface. Using optical analysis technology, a three-dimensional image is generated and assures that the truck is ready to be loaded. During the loading process, open trucks on two travel lanes are alternately loaded with stacks of bags.This is done by a feeding rack installed over the truck. Once the loading of the first truck is completed, the SpeedFlexx changes lanes within 11 seconds and the second truck, which in the meantime had positioned itself in parallel, is then loaded. 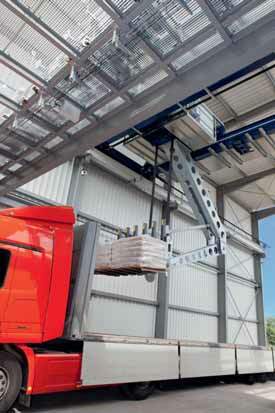 The result: continuously high loading speeds are achieved during peak times. Considering the anti-cyclic demand of the daily profile of a loading system, timeframes with reduced truck frequency will lead to the filling of the adjacent pallet stock. Here stocking is handled in the usual manner: with forklift trucks. This enables continuous use of the packing and palletizing plant, and thus optimum utilization of installed capacity. Moreover, in the event of bottlenecks, it is also possible to reverse this process, i.e. to feed the SpeedFlexx from a filled stock. The SpeedFlexx is impressive because of its loading speed and the unique logistical flexibility it offers to the market.